It is hard for us at Mile High Pedicabs to believe, there are some people who either do not know how to ride a bicycle, or, simply do not want to ride a bicycle. As you may have guessed, since we are a Pedicab company and also a Bike Bar Tour company, we are huge fans of bicycles of all forms, and in all settings. That said, we at Mile High Pedicabs understand that not everyone is comfortable being the driver of a bicycle in the big city. It is one thing to ride around on country roads or in your neighborhood, but, being the driver of a bicycle in downtown traffic can be fairly intimidating to most. Nonetheless, Mile High Pedicabs have an amazing way that even those who most fear cycling in downtown traffic can experience the great fun of being out in the open air, in the middle of all of the excitement, but without having to be in the driver’s seat. Catch a ride on one of our Pedicabs in Denver—you will have more fun than you imagined possible. Sometimes it is nice to just sit back and enjoy, and not have to be in charge. And, you can be in the middle of the excitement without having to be in control. We can drive you from one event to another—maybe you need a ride from dinner to the concert you are heading to, or maybe you want to switch bars to meet up with some friends. Whatever the case may be—we can pick you up, drop you off, and you can have an adventure during the ride to and from. Sure, you could just “take a cab,” but what fun is that? With Pedicabs, you are out in the fresh air, can see, hear, smell, feel the sights around you, and you might even engage with the people on the streets in conversation and song. 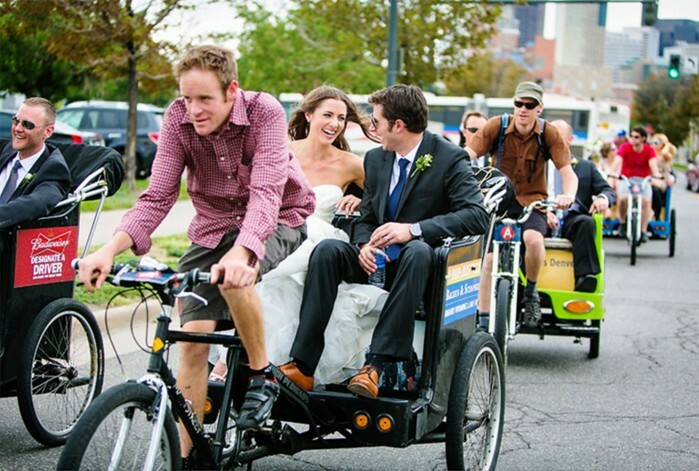 In addition to simply giving you a ride from one place to another with your partner or a friend or two, you can hire Mile High Pedicabs for events and group things. We’ve had people hire us for Weddings, Pub Crawls, and much more! Please call Mile High Pedicabs or check out our website for more information. Getting a ride from by Pedicab is unlike any other form of transportation that you’ve ever used.